Axis Bank, India’s third largest private sector bank, today unveiled its digital retail banking roadmap. The bank aims to offer superior, multi-level, simple, instant and secured financial solution for the fast evolving NextGen – the largest user group of mobile banking, aged between 18 to 35 years. Axis Bank sees mobile banking transactions surging over internet banking in the next five years. The transactions on Axis Mobile recorded a 10-fold increase in the last 12 months, the fastest increase among all technology channels over the same period. The bank has seen an increase in the usage of the Mobile App, up from 2% to 10% in the last two years with an average frequency of three logins per month, and expects the transactions to rise in future. The App has been launched in partnership with Tagit, a leading Singapore mobile solutions company. The new application uses Tagit’s mobility solution platform that enables Banking ‘on-the-go’. This secure, robust and highly flexible platform offers single configuration for multiple handsets and operating systems, allowing the bank to offer new features and roll out updates faster – both at the application and the mobile operating system levels. Mr. Rajiv Anand, President, Retail Banking, Axis Bank said: “With Online services and sales rapidly growing, we expect more than half of all transactions will be through the Internet. This adoption to new age banking, innovative and personalised multi-channel banking experience on ATM, Internet, and now the Mobile app and social media interface would be the driving force behind Axis Bank’s Digital strategy.” With an aim to reach out to 1.5 million customers the bank has launched Mobile Banking App 2.0 for its retail resident Indian customers, Mr. Anand said. 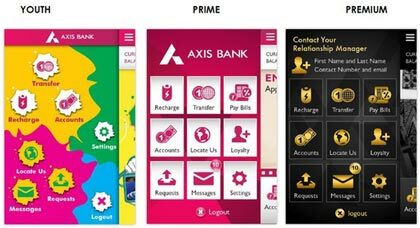 The first of its kind in India, Axis Mobile 2.0 offers a high level of personalisation, allowing users to customise their mobile banking experience, depending on the user segment (Youth, Premium and Prime segments). The new Axis Mobile App will provide customers a never-before experience of accessing their savings as well as credit card accounts and manage transactions including account enquiries, bill payments as well as fund transfers on their smartphones. With emphasis on safety and security Axis Bank has ensured transactions through secure onboarding and mPIN verification. Initial downloads from the Google Play store have generated huge positive response with users appreciating the new navigation and user interface. Designed with convenience in mind, the app will be accessible across all mobile devices and operating systems. Currently available on Apple and Android phones, a version of the New Axis Mobile App will soon be made available to customers on Blackberry, Symbian, J2ME, Windows and tablet-based platforms. With its 1,947 domestic branches (including extension counters) and 11,245 ATMs across the country, as on 31st March 2013, the network of Axis Bank spreads across 1,263 cities and towns, enabling the Bank to reach out to a large cross-section of customers with an array of products and services. The Bank also has overseas offices in Singapore, Hong Kong, Shanghai, Colombo, Dubai and Abu Dhabi. Tagit is an award-winning Singapore-based mobile solutions company. Tagit’s mobility platform Mobeix™ enables banks and enterprises to rapidly build secure, scalable and innovative mobile applications.